Tokyo's Kabuki-za ranks among the most historically important theatres in the world. The victim of fires, earthquakes, bombing, and business decisions, its current incarnation--on the same site as its predecessors--is its fifth. The first lasted from 1899 to 1911, when it underwent a large-scale renovation. The second version survived from 1911 to 1921, the third from 1925 to 1945, the fourth from 1951 to 2010, and the fifth was opened in 2013. The essay below is the first in a planned series--based on a 1995 Japanese book called Kabuki-za Hyakunen-Shi published to commemorate the theatre's first hundred years--that will cover the Kabuki-za's history, year by year, from 1889 to its do-over in 1911. Hopefully, if I live long enough, the series will continue after that as well. The series begins with an excerpt from Chapter Twelve, “Playhouses, Programming, and Plays” in my Kabuki at the Crossroads: Years of Crisis 1952-1965 (Leiden: Global Oriental, 2013). It is edited and abbreviated from the original version, which surveys the Kabuki-za’s history through 1965. What stands on the same site now is the theatre’s fifth version; it opened in 2013. Please click on the images to see full versions of them. In April 2010 a large sign with an electronic countdown mechanism stood in front of Japan’s most famous theatre, the Kabuki-za, noting the number of days left before the theatre closed down so that its Momoyama-style façade and postwar modern interior could be demolished.1 That day came on April 30, 2010; a year later, a large hole demarcated by white construction walls here and there adorned with the traditional green, black, and persimmon stripes of the kabuki curtain, stood where the iconic playhouse had been since January 1951. Of course, that theatre was only the latest in a series of Kabuki-zas that had occupied the space since 1889, and it would not be the last, as yet another Kabuki-za opened there in 2013, with a façade resembling the world-famous one incorporated into the front of a towering office building, and an updated replica of the stately, red-carpeted lobby now gone. The theatre’s entire last year was celebrated with each month’s program being called “Sayonara Kabuki-za,” and on the day after its last show ended, the theatre was packed for a farewell ceremony, with well-wishers there to wish this great playhouse goodbye. Ever since opening in the late nineteenth century, the Kabuki-za had ruled the roost among all theatres in Tokyo, not to mention Japan, even when more elaborate ones, like the Kokuritsu Gekijō (National Theatre, 1964), were built. It was here, in Tsukiji, that Japan’s foremost kabuki actors starred, beginning with Ichikawa Danjūrō IX and Onoe Kikugorō V; the Kabuki-za was to Japan what, for their respective purposes, Drury Lane and Covent Garden were to London, the Comédie Française to Paris, the Bolshoi to Moscow, and the Metropolitan Opera House to New York. It experienced some rough times between 1951 and 1965, but, despite serious slumps when—to the dismay of many theatre fans—other types of performance began to invade its cypress wood stage, it continued to be the main producer of kabuki into the twenty-first century, and will undoubtedly follow that path in its newest incarnation. Fukuchi, son of a Nagasaki doctor, knew both Dutch and English, and had visited the West with the first government delegations, serving as their sole interpreter. Theatergoing was part of the agenda, and when Fukuchi noticed the people in his group falling asleep because they could not follow the dialogue—to the annoyance of their Western hosts—he began to explain the plots before the play began and the sleeping problem mostly disappeared. This is how he began to learn about the theatre. [2 I rely here on Watanabe Tamotsu, Watashi no “Kabuki-za” Monogatari (My “Kabuki-za” Story) (Tokyo: Asahi Shinbun Shuppan, 2010), 20–37, and Nagayama Takeomi, ed., Kabuki-za Hyakunen-Shi, Honbun Hen 1 (Hundred Year History of the Kabuki-za, Main Volume 1) (Tokyo: Shōchiku Kabushiki Gaisha Kabuki-za, 1995), 39–63. The latter source provides many excellent illustrations. Back in Japan, much of kabuki seemed nonsensical to him compared to the more rationalistically based theatre he had seen in the West and he began discussing with the progressively-minded Danjūrō IX ways of reforming the stage. Meanwhile, Fukuchi had become a leading journalist and editor, with his hand in politics as well. With capital supplied by the financier Chiba and the support of Japan’s leading actor a new playhouse was planned that would put Fukuchi’s reformist ideas—part of a theatrical reform movement (engeki kairyō undō) that emerged in the late 1880s—into use.4 Thus the new theatre was founded not as a base for traditional kabuki performance but as an advanced, modern, innovative enterprise designed to raise Japanese theatre to a level comparable to theatre in the West, something happening in almost every other area of Japanese life at the time. Even its Western exterior reflected this obsession with foreign standards.5 But the new theatre had to overcome the objections of Kanya, who gathered the four major theatres of Tokyo at the time—the Shintomi-za, Nakamura-za, Ichimura-za, and Chitose-za (later Meiji-za)—into the Four Theatre League (Yonza Dōmei) as a conservative opposition to Fukuchi’s plans. 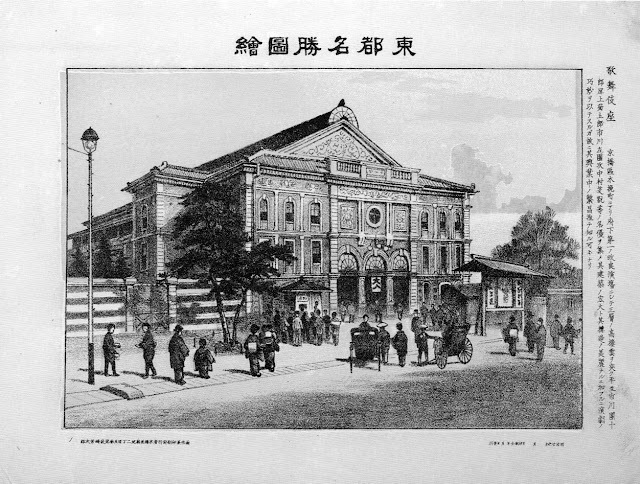 In 1888, before it was built, the theatre’s name was changed to the Kabu-za, which, using the first two Chinese characters in kabuki—歌舞— meant “Song and Dance Theatre”; however, kabu, written with another character, 蕪, can mean radish; a synonym for radish, daikon, was used to refer to lousy actors,3 so Kabu-za was replaced by Kabuki-za, first used by Fukuchi in a September 18 newspaper article about the Four Theatre League, whose support was crucial to the Kabuki-za’s realization, since its actors were necessary for the formation of a troupe. When the theatre opened, it played it safe by offering a traditional program, but on its second program, a reformist play was introduced. In the late nineteenth century, despite the long history of the word kabuki, it was more common to refer to it as shibai; later, shibai could refer to a range of theatrical genres, but at the time it meant only kabuki. Calling the theatre the Kabuki-za was a ploy to defer to conservative forces by employing a word that conjured up the conventional old-time theatre despite the venue’s intended progressive agenda. This contradiction arose because of the contemporary tension between indiscriminate acceptance of all things Western and the fear of losing essential elements of traditional culture. Exterior of the first Kabuki-za. From Tōtō Meishō Zue. Unfortunately, the reformist plays—mainly history plays based on antiquarian research—fizzled when it came to audience interest, much to Danjūrō’s chagrin. More problems emerged in 1894 when there was a sudden interest in realistic, jingoistic war plays based on the Sino-Japanese conflict; in May 1895, the most successful producer of such plays, the non-kabuki actor Kawakami Otojirō (1864–1911), was permitted to use the Kabuki-za stage, where his success was so great he was invited back in July. Danjūrō refused to return until the stage floor was scraped clean. In fact, a compromise was reached when it was agreed that the stage would be scrubbed with lye. Danjūrō now resolved to focus on revivals of traditional kabuki. To a kabuki actor the stage was a sacred place, especially the cypress wood flooring used for the classics. Danjūrō’s decision to treat his home stage as sacred and return to the classics was an important historical moment. And his renewed attention to preserving the classics in the face of competition from rising new forms such as shinpa (of which Kawakami was a founder), made the Kabuki-za Japan’s foremost venue for traditional kabuki, a reputation preserved by all the actors who succeeded to leadership after Danjūrō’s death in 1903. Almost every one of them had an artistic or family connection to Danjūrō, and saw it as their inherent duty to carry on his goals and keep the cypress stage unsullied. 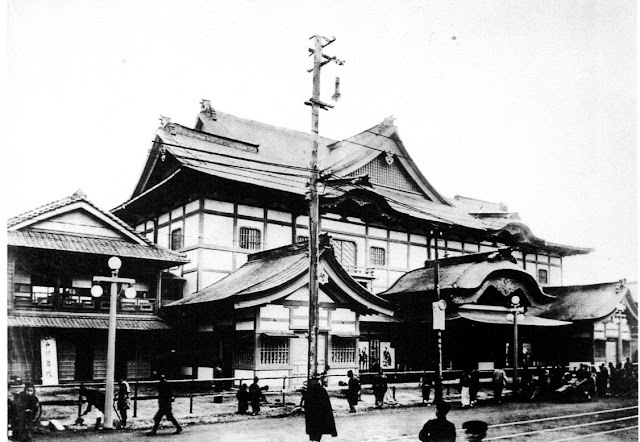 Second Kabuki-za (after 1911 renovation of first one). From Kabuki-za Hyakunen-shi. As noted, the original Kabuki-za was built with a Western-style exterior, but in mid-1911, just as the Meiji era was shading into Taishō (1912–1926), this was renovated to resemble traditional architecture based on Japanese shrine structures. That year, the Teikoku Gekijō (Imperial Theatre, still in use after several renovations) had opened in Tokyo with a completely Western-style interior and exterior making it look much like any ornate theatre in Europe or America, so the Kabuki-za responded by reminding the public that it housed and maintained traditional Japanese theatre, even though an alternative approach might have been to emulate the general look of an actual Edo-period theatre using modern materials.